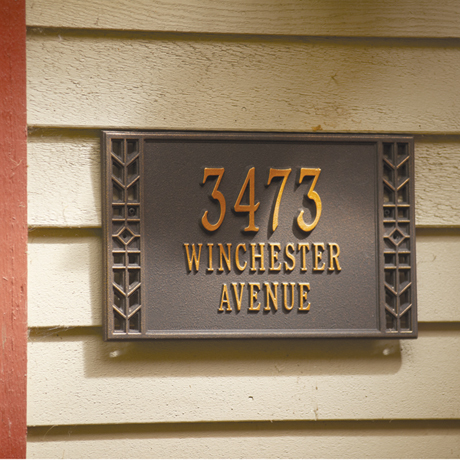 Symmetry, artistry, and quiet elegance characterize the Arts and Crafts style, and this address sign. Crafted in sand-cast recycled aluminum with raised letters, it has a weather-resistant oil rubbed bronze finish that will last a lifetime. Mounting screws included. 15 1/2" x 9 1/2". Made in USA. Specify 3 lines of up to 6 characters for line 1, up to 13 characters for lines 2 and 3. characters each. Allow 3 weeks. No rush delivery or gift box.